This religious tapestry "Nativity – Giotto" shows a scene from the art of Giotto di Bondone (1267-1337). The originals are seen in Scrovegni's Chapel in Padova, which contains the master works of this 14th century Florence painter. The scenes include his most influencial works, with scenes focusing on Mary and the Nativity, the Annunciation and the Last Judgement. Of the 37 scenes here we see Mary and Child, with the angels flying toward the baby Jesus. A scene filled with activity, this work is beautiful in its use of color and composition. The golds in the angels' garments, wings and haloes, including the halo around the Christ child is symbolic of the purity of their beings. Giotto has included the barn animals of the stable in this scene. 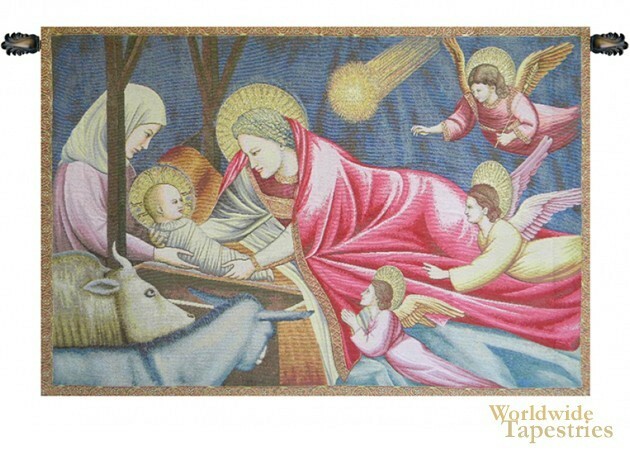 This religious tapestry "Nativity – Giotto" is backed with lining and tunnel for easy hanging. Note: tapestry rod and tassels, where pictured, are not included.